Two students who will be entering secondary school for the first time in September were officially welcomed to the family of the St John’s Educators Scholarship Fund (SJESF), on Monday when Founder of the Fund, Carnice Modeste, presented them with their first cheque. This assistance was provided to Shakira Harriman and Sade Smith following a recommendation by the principal of their former school. The scholarship provides EC$1200 per year to assist needy students who are successful at the secondary schools assessment examination. Urging the students to continue working hard in order to maintain the scholarship, Modeste cautioned that those who fail to maintain good grades will have to “buckle up and work hard” because in the future those who fail to maintain good grades stand to be dropped from the Fund. “Your requirement for maintaining the scholarship is good grades and good conduct, there are lots of things you will have to maintain but these two will be most important. You make me proud when you do well, when you do well I feel like I am making a difference,” she told the students. Modeste disclosed that Oslyn Radix-Thomas, who is a new member to the committee will be monitoring the progress of those who are receiving assistance from the fund to ensure that high standards are maintained. Radix-Thomas is the former principal of the St John’s Anglican School, recently retired from the Public service. The former principal in a motivational and inspiration talk to the students and their parents before the presentation of the cheques, said that they should be aware of the associates of their children, because those associates can influence their behavior and attitude. “Talk to your children, know who they friends are, let them know that there is a time for everything,” she said. She urged the parents to be on top of these with their children. “Make them your friend and listen to them,” she said. Former recipient Jordan Charles, who sat 13 subjects and graduated with honours from the Presentation Brothers College, was presented with a plaque for his outstanding performance. He urged the students to apply themselves positively and creatively as the 5 years will go quickly. “It will be challenging, but aim towards accomplishing it and that is what matters,” he told those who will be continuing in the fund, as well as the two new students. The Fund began in 2008. At present there are 10 students in the programme, 4 of whom will graduate by the end of 2014. A local committee and the New York Committee both engage in all fundraising activities. 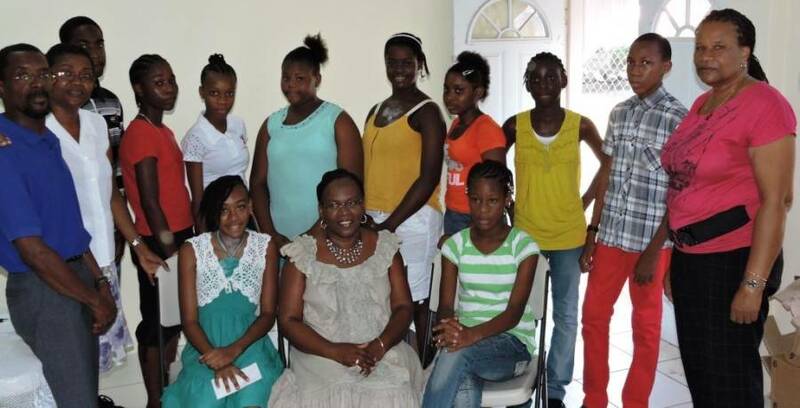 Modeste is based in New York and travels to Grenada annually to make the presentation to the students. She has also attended the graduation ceremony of those who successfully completely secondary school in the last 2 years.